£50 Deposit secures any 2019 holiday the balance can be spread in installments. £50 non refundable deposit secures the booking with the balance due 4 weeks before arrival. 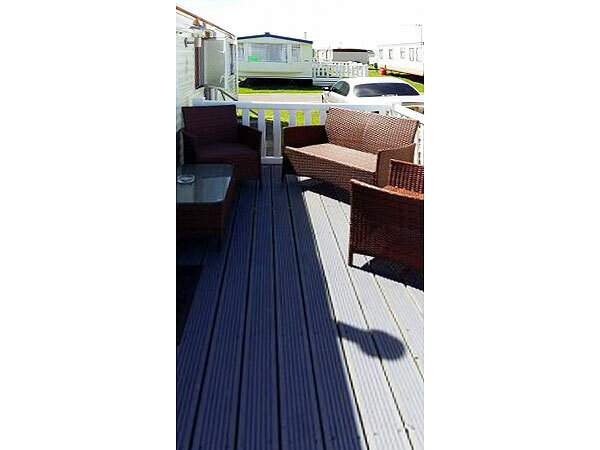 IF THE DATE YOU REQUIRE IS SHOWING AS BOOKED PLEASE CONTACT US AS WE OWN ANOTHER 2 CARAVANS THAT ARE NOT LISTED ON HERE YET AND MAY HAVE AVAILABILITY. 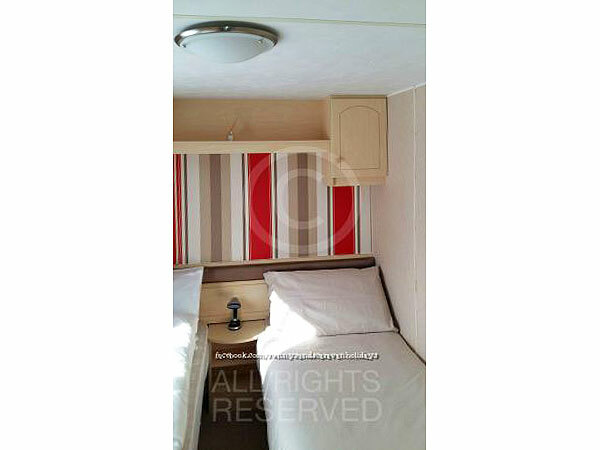 1 IS A 3 BED, 8 BERTH THE OTHER A 3 BED 6 BERTH. 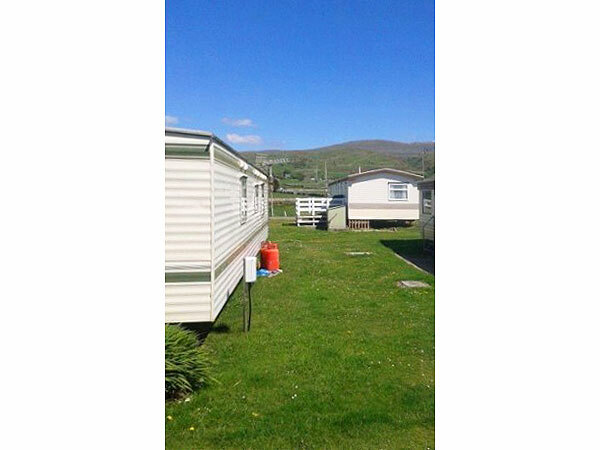 3 Bedroomed caravan with mountain views. 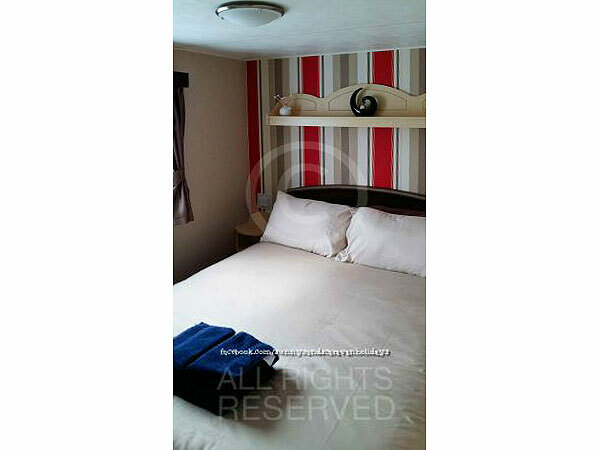 Fully equipped, sleeping upto 8 people in 1 double bedroom, 2 twin bedrooms and a pull out double sofa bed in the lounge. 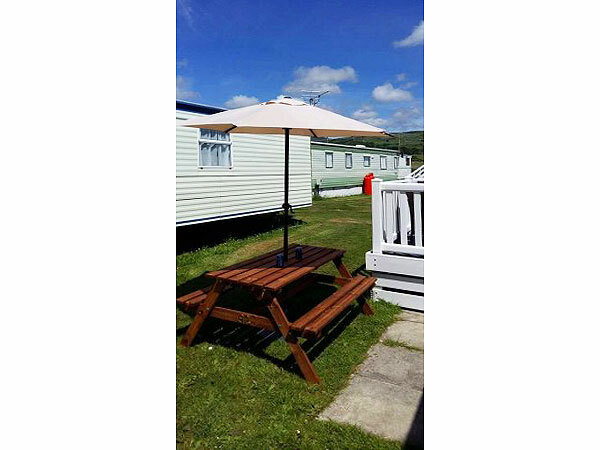 Outside space includes, parking, picnic bench, enclosed decked area with table and chairs one end and a rattan seating set the other there is also a storage tub with a small selection of outdoor toys to keep the children happy. 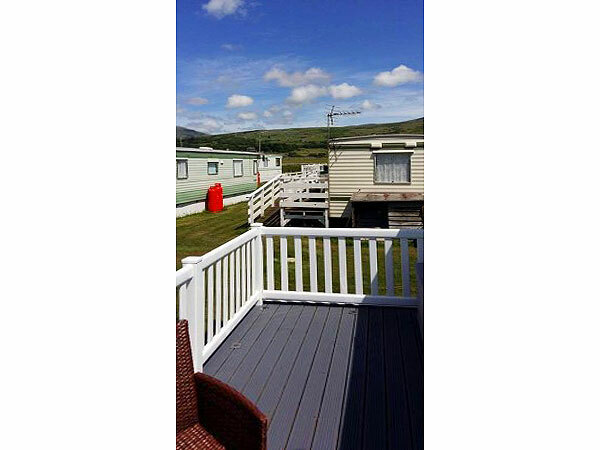 The caravan is located far enough away from the facilities to be a little bit quieter, yet is only a 2 minute walk to either the beach or the sites facilities. 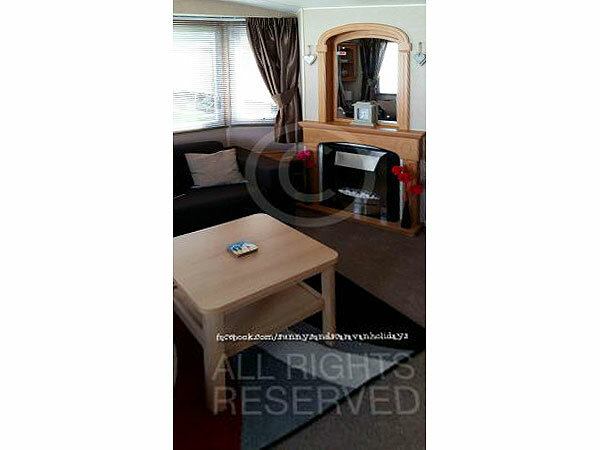 Large lounge with views of the mountains, 32" Freeview, LED TV, Sky HD box (free view channels only), DVD player and a selection of DVD's, Books and games and an electric fire for the colder times. 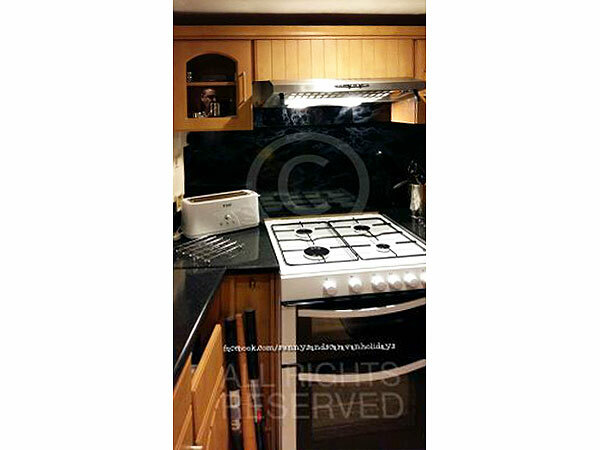 The kitchen is fully equipped including full size cooker with seperate grill, microwave, tassimo drinks machine (pods not provided) and fridge / freezer. Large shower cubicle, sink and electric towel radiator / heater. Twin beds, single wardrobe, storage cupboard (used for cleaning equipment), cupboards and drawer, electric convector heater. Double bed, double wardrobe, fitted cupboards and drawers. 24" TV with built in freeview and DVD player, Electric convector heater. Security safe in wardrobe. 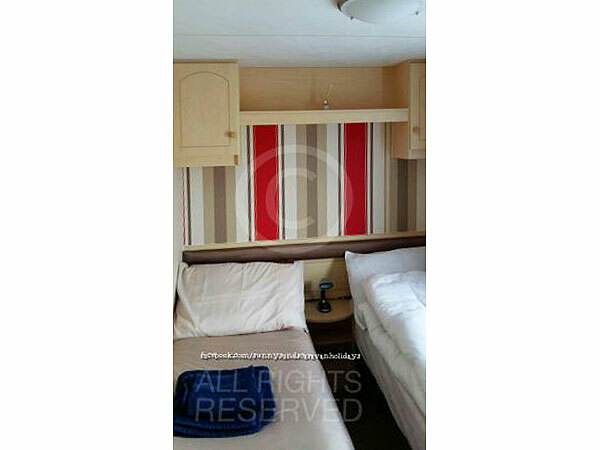 Twin beds, single wardrobe, cupboards and electric convector heater. All bookings for 7 nights include beds made up on arrival, a towel bundle consisting of 1 x bath and 1 x hand towel per guest, T towel and hand towel in kitchen, hand towels in WC and Shower room. 3 or 4 nights breaks bed linen and towel available to hire. There is NO smoking, Vaping or any other form of E Cigs allowed in the caravan. 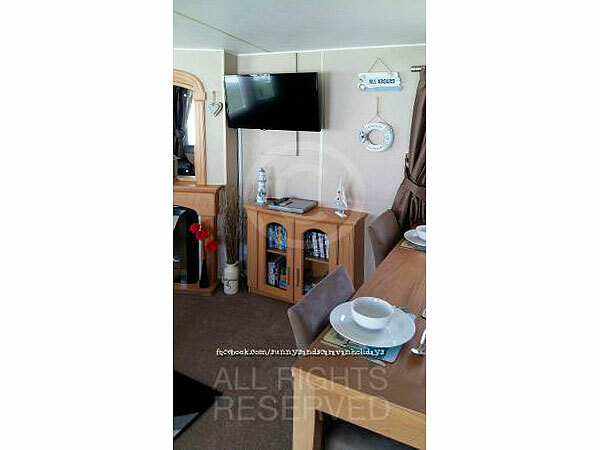 All comments by Sunnysands Caravan Holidays are genuine comments posted to our facebook page and copied here by us. The original comments can be seen on our Facebook Page and visitors book in the caravan. 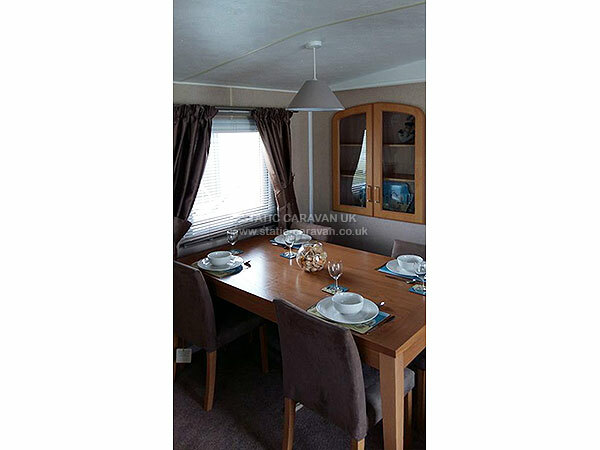 Atlas Sapphire, 3 Bed, sleeping upto 8 in 1 double, 2 twin bedrooms and a pull out double sofa bed in the lounge. This van wont have any decking in 2018 but does have a small patio area. 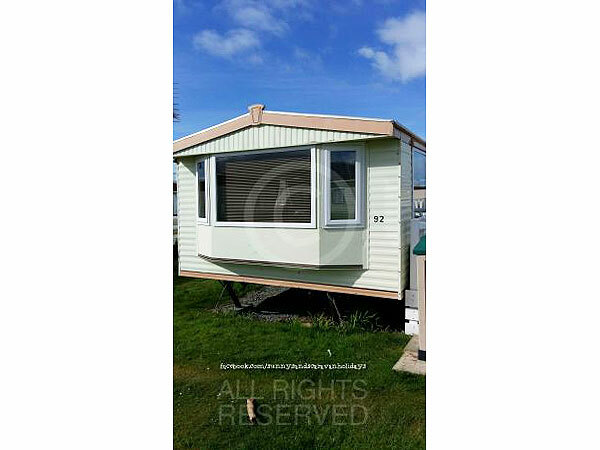 Cosalt Capri Super, 3 Bed, sleeping upto 6 in 1 double, 2 single rooms and a pull out double sofa bed in lounge. This van has been completely remodeled and refurbished for 2018. ALL bookings are subject to a £50 Damage / Cleaning deposit, this is refunded after checkout / inspection. The site charge between £30 - £40 for the site pass, this is payable to reception on arrival, they will refund £10 when the keys are handed back at checkout. We have no control over this charge as it is Sunnysands themselves and not us who charge this fee. 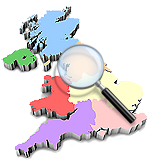 £50 non refundable deposit secures the booking with the balance and cleaning / damage deposit due no less than 4 weeks before arrival, monthly instalments can be arranged at no extra cost. JULY and AUG 7 nights minimum, shorter breaks are possible at all other times, please enquire. 7 night holidays start on a Saturday. 4 night breaks start on a Monday.